On August 1, 2017, Brittany Cloyd from Frankfurt, Kentucky, she said, was in pain “worse than at birth.” Her mother, who was in the nursing school, took her to the nearest emergency room clinic (ER – Emergency Room). Brittany thought that her appendicitis burst, but tests made in the ER showed that she had multiple ovarian cysts. She was given pain medicine and told to monitor the situation with her main doctor. Cloyd has PPH Anthem Blue Cross health insurance, and she hoped that she would only be paid in part for her visit to the ER, and the rest would be covered by insurance. Instead, after 15 days, she received a letter from the insurer stating: “Your condition does not meet the definition of an emergency”, and therefore the woman, according to the letter, had to pay the entire bill from the ER, which was 12,596 dollars, writes CBS News. The situation faced by Cloyd is becoming increasingly common in the health insurance industry, according to a study by the Doctor Patient Rights Project (DPRP). And PPH Anthem Blue Cross, which, given its subsidiary networks, is the largest private health insurer in the country, has taken the lead in refusing to pay for emergency services. DPRP argues that Anthem has a waiver policy designed to make their customers afraid to apply for ER services for fear of a huge bill. However, Anthem did not provide specific explanations as to what is the proper reason for the visit to the emergency room. But in a letter addressed to companies insuring their employees through Anthem, the insurer made it clear that he would not want his clients to apply for grinding at the ER, when they could be easily cured in a doctor’s office or a regular clinic. According to representatives of Anthem, more than a quarter of visits to emergency departments made by customers of the company could have been avoided by solving the arisen health problem elsewhere. “If we could cut down on unnecessary visits to the ER, we could cut spending on healthcare by 4.4 billion dollars a year,” the company said in a letter. Kentucky is not the only state where Anthem has this policy. This also extends to the South and Midwest. 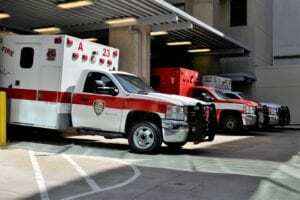 In Georgia, the American College of Emergency Training and the State Medical Association filed a lawsuit in federal court demanding that Anthem’s unsafe policy on refusals to cover the costs of patients for emergency medical care. US Senator Claire McCuskill sent a letter to the US Department of Health and Human Services, as well as to the Department of Labor asking to investigate whether certain insurers violated the terms of their insurance plans by refusing to cover certain expenses. In 1997, Congress passed a law on the standard of non-expert caution for Medicare and Medicaid, and in 2010 it was expanded to group and individual insurance plans. He defines an “emergency situation” as one in which knowledge of an average person about health and medicine gives him grounds for contacting the ER based on the acute symptoms of a sufficient degree of severity. 137 million people visit the ER every year. According to DPRP, on average, almost every fifth US citizen is reported to the ER every year, which gives a total of 137 million visits to these clinics per year. Statistics from 2012 that the average cost of a visit to the ER is 1233 dollars is very outdated. One of the reasons for the increase in prices since then, according to a study by the University of Maryland: an increase in the number of cases of substance abuse, especially among young people and middle-aged people, in most cases, such abuse is treated in the ER. According to Anthem, even small savings can benefit the US healthcare system, in which Americans spent almost $ 3 trillion in 2015. The proportion of patients who leave the ER without treatment in general is 5%, according to Anthem. At the same time, the Centers for Disease Control and Prevention (CDC) say that this proportion is at least 3.3%. CDC data also shows that applying to the ER can be the right decision and save lives in the event of a serious condition, such as chest or abdominal pain, as well as high fever. 43% of cases of treatment in the ER lead to hospitalization of patients. Those who feel that they have been unjustifiably denied payment for medical services can file an appeal. “Patients must first contact the insurer,” explained Stacy Worsy, executive director of Aimed Alliance, which works in the field of innovative medicine. If you received a letter from the insurer with a refusal to pay the bill, send them in response to the documentation with justification of the need for treatment in the ER. If you get a second refusal, request an external review by an independent party, possibly a state insurance regulator, or someone whom he appoints. A study conducted in 2016 showed that 52% of patients who refused an insurer to pay bills for emergency medical services, after an independent review, ensured that the insurance company paid their bills. Cloyd sent a letter to Anthem confirming the need for a visit to the ER, which also indicated that “she doesn’t know how a patient actually has internal bleeding,” but that her feelings were very painful and frightening. suspected exactly that. As a result, Anthem paid the entire bill in the amount of 12,596 dollars.